While Secular Humanist sociologists sometimes refer to sociology as an art rather than a science, Marxists ground their social theory firmly in what they believe to be the scientific fact of Darwinian evolution. This scientific foundation for sociology is “Darwinism in its application to social science,”2 according to G.V. Pkekhanov. Humanity is not only evolving biologically, but also socially. As humanity improves through the evolutionary chain of being, so does society. 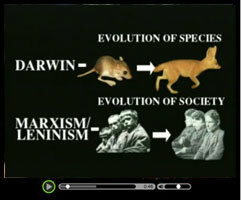 The scientific fact of biological evolution guarantees both the truth of Marxist social theory and the outcome of its practice: an international communist family. In the Marxist system, economics determines the nature of society—its politics, religion, law, and culture. Our economic system (feudalism, capitalism, socialism, etc.) determines how we relate to others so that we operate efficiently within the system. In other words, the way goods are produced and distributed determines the way people relate to each other, which in turn determines the structure of society. The development of society continues past the bourgeois stage until it reaches a communist stage. The concept of the dialectic, however, requires that such development will also continue past the communist stage. The communist society becomes a new thesis, leading to antithesis, clash, and synthesis. In this view, then, the Communist society is also transitory. According to Marx, “The mode of production of material life conditions the general process of social, political, and intellectual life. It is not the consciousness of men that determines their existence, but their social existence that determines their consciousness.”5 The economic system determines society, which determines our very consciousness. Economic forces thus supplant our free will. The individual is insignificant in the face of powerful societal forces. Stalin believed that in order to understand history, we must rely “on the concrete conditions of the material life of society, as the determining force of social development; not on the good wishes of great men.”6 The evolution of society is too powerful a force to be affected by the actions of even the best individuals. Although Marxist sociology denies that we have free will and believes that our social systems are determined by economic forces, Marxist sociology also believes a time will come when we can play a part in consciously working toward the next phase of social development—the overthrow of capitalism by the proletariat. Marxist sociology and psychology run parallel at this point: our individuality and usefulness are determined by society until the time when our free will is required to create the socialist society. At this point in history, the proletarian revolution will provide a position where we can control society by controlling the means of production. In the Marxist worldview, the advent of the communist society is inevitable, so the individual is free to create the new society only by going along with the evolutionary process that leads toward communism. Marxist sociology sees the economic system of a society as the determining factor for all its social institutions. Since the economic system is in a process of constant development, all institutions in society are also evolving. This development occurs regardless of the actions of individuals—in fact, it often occurs in spite of them. Marxists believe the next step in economic and socio-cultural evolution will be a world socialist system (the abolishment of private property) and a new world order that will emerge as a result of the changed means of production. The new society will develop a proletarian system of education and family based on materialism, atheism, punctuated equilibrium, and communism. Marxist sociologists are confident this will occur because they believe their system of sociology is grounded in naturalistic science. 3 Karl Marx and Frederick Engels, The Individual and Society (Moscow, USSR: Progress Publishers, 1984), 193. 6 Joseph Stalin, Problems of Leninism (Moscow, USSR: Progress Publishers, 1947), 579. Cited in Gustav A. Wetter, Dialectical Materialism (Westport, CT: Greenwood Press, 1977), 217. 7V.I. Lenin, Collected Works, 45 vols. (Moscow, USSR: Progress Publishers, 1977), 1:142.